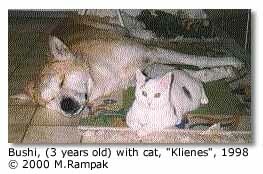 This story is reprinted here with permission from M. Rampak and Akita Club DE. A very special thank you to Gabriella Smith for translating this article. Repeated inquiries about Bushi's Condition, Sebaceous Adenitis (SA), and the treatment I am using prompted me to publish this Report. I am not sure about long term results of the treatment yet and that is why I would have preferred to publish this report at a later date. However, since the results were such a huge success, I decided to report results through monthly updates. At this time there is no known cure for SA to my knowledge, and based on my experience, the side effects of SA can be successfully treated. I also don't know if you can generalize this treatment. I do know that based on results to date, I am having success with Bushi. The items I used on Bushi are what I found in Germany, however a translation and a source for these items in the USA is included at the end of this document. Do I have to put Bushi down? After spending thousands of Dollars in medical bills for Bushi and his condition was worsening to the point where Bushi was an unrecognizable caricature of himself, with slow creeping movements and a body covered with stinking sores, the thought crossed my mind to put him to sleep. But when I discovered how little effort it took to turn Bushi back into a happy, free of sores Akita, I was grateful that I did not act upon this thought. 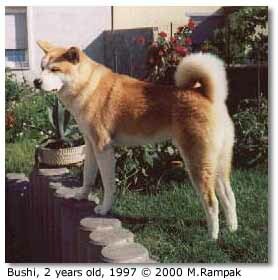 On the last weekend in June of 1999, I treated all Inflammations on Bushi's body with Calendumed ointment. It softened the crust of the sores and I was able to remove the crusts from the dogs body with a minimum of discomfort to the animal. When I had problems with the hair sticking together that surrounded the crust of the sores, I carefully used a flea comb to remove it. If all the crust does not come off with the first treatment, repeat this treatment. The crust must come off. The treatment may have to be repeated several days in succession. During each treatment, I treated all diseased areas including the ones where the crust had already been removed. The dog should, under no circumstances, feel stressed, so I included plenty of breaks for Bushi to rest. In addition to this treatment, I gave Bushi a Capsule of 250 mg Vitamin E each day and 3 times each day, Bushi was given 5-10 pills of Calendula D2. After 4 Weeks, I administered a stronger form of Calendula, D4. To get Bushi to take the pills, I put them on a spoon and placed them on his tongue. After several days and after all the crusts on the Sores were gone, I covered Bushi from Head to toe in Hettral Johanniskraut oil. It took between 100 ml and 200 ml. The importance was having the oil penetrate down to the skin and rubbing the oil carefully into the skin. Bushi looked like he fell in a barrel of oil. Great care was given not to get any oil into the eyes or the ears. However, if the ears are dry on the inside, take a small amount of oil and treat them separately. After each treatment, I kept the dog busy for 2 hours. Most of the time we went for long walks to avoid extensive licking. If every thing else fails, a lamp-shade -collar is useful. After two hours, it was time for a bath. The Shampoo I used was Editerm by Virbac. I shampooed 2 times. I gently removed the oil from the hair. Then I applied a conditioner by the name of Humilac, also by Virbac. The doghair remained somewhat oily. I used a paper towel from time to time. After 2 to 3 days, the hair and skin absorbed the remaining oil. I repeated the treatment every 10 to 14 days. After about 8-10 days, Bushi was covered in dandruff and he constantly scratched. I thought something had gone wrong but I soon discovered the itching was due to the skin healing. The first thing I noticed was the foul smelling odor was gone. Now Bushi smelled a little like rancid oil. Also on the hairless spots where the dandruff had completely peeled off, the skin looked healthy. Two weeks later, I repeated the same procedure this time mixing a baby oil brand that uses very little chemical substances and a minimum of perfume, with 5 ml of Calendula Extract. Allow the oil to penetrate the skin for two hours and follow the same bathing procedure as outlined above. After 4 to 6 weeks, all superficial inflammation was healed and gone. And on the hairless spots, hair started to grow back. However, I continued to treat Bushi every 14 days. Always the same, starting with oil, ending with conditioner. In the Middle of August, Bushi's Hair growth seemed to explode. 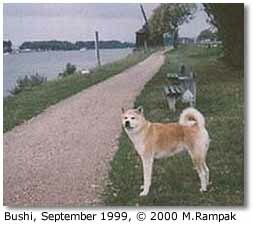 With all the skin healthy and healed, Bushi became more active than I had ever seen before. His appetite started to increase and knowing hair consists mostly of protein, I feed him an extra meal every day. By the end of September, Bushi had regained 85% of his former looks and I could extend the Oil treatments to 3 weeks. At the present time, I treat him every 4 weeks. At the beginning of October, I added OMNIFLORA N, a type of Yoghourt, to Bushi's diet. This was given to improve his intestinal flora which had suffered under the influence of all the previously prescribed antibiotics. December brings a different kind of Problem. Up to now, I was able to do the oil procedure outside. But due to bad weather, we had to administer the treatments in the shower which meant I had to sit in the shower for 2 hours with Bushi. It took a lot of coaxing and good words to finally lure Bushi into the shower only to discover that both of us did not fit in the small shower stall. I grabbed a pillow, kneeled beside the shower and started the usual procedure. As long as I was working on Bushi, time went by fast, but I wanted to let the oil soak in at least 1 hour and Bushi got restless. In order to shorten the time for Bushi and me, I started telling him fairytales that I remembered from my childhood. I heard my wife laughing in the kitchen. After the last step of the treatment, I warped Bushi in a towel and carried him into the yard. He was so happy to be out of the shower that he never seemed to tire of running and jumping. that Noah took into the ark were Akitas. I stopped giving Bushi Calendula D4 and the 250mg Vitamine E had been reduced to twice a week. Since I started with the treatment in June 1999, Bushi did not have any more inflammations and his coat looks much better. He regained 85 to 90% of his former looks. 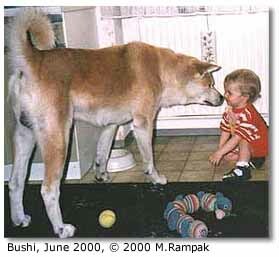 In January 2000, Bushi got his shots and I was concerned as to how it would affect his immune system, but everything went well. The treatment is still successful. In spring, Bushi blew his coat and lost all his undercoat. He looked very thin for a short time but his coat grew back healthy. Since I started the treatment, nearly 6 months have passed and I have answered all the many questions about Bushi's condition with he is still fine. This I know sounded like I was waiting for a relapse. I was afraid that a relapse could come at any time. Also I did not think that something as easy as what I had done to conquer this condition would last. The most difficult part was to do the treatment four times in the winter months in the shower. As I think back, I started in June of 1999, and for a while, I did the treatment every two weeks. Then I was able to wait three weeks between treatments and then four weeks. I had tried to increase the time between treatments to five or six weeks, but the skin was beginning to flake again, and I decided to level off at four weeks. The Treatments stayed the same. It looks like Bushi and I are going to use a lot of baby oil and Calendula extract in the coming years to treat an illness for which there is no cure. The hope that Ciclosporin would make a big difference in the treatment of SA seems to be unfounded. 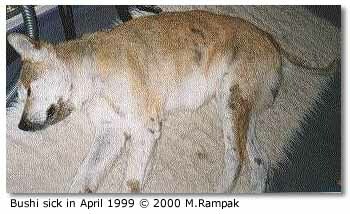 Six Akita owners with dogs with SA contacted me about my report. That was in Dec. 1999. I personally have not received any feedback from the owners as to whether or not the treatment I outlined was administered and with what results. Two dogs are doing fine, but I do not know if the treatment has helped them or if the owners went to another source. 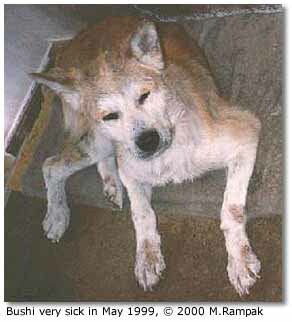 I heard that one dog had to be put down and one dog was too old for the treatment. Nothing from the remaining two. It was disappointing to me not to hear from the owners as promised after our first contact. 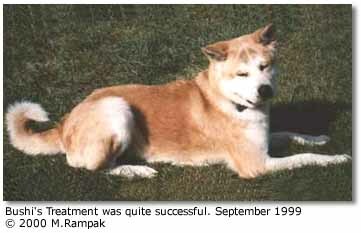 (Webmaster note: Since I first published this article in June I have used the Rampak treatment on my SA dog, Taka. I have published a story of his results and you can access it through this page: Taka's Story, an SA Diary). I worked out this therapy by myself, however, many of the bits and pieces that make up the whole puzzle were collected from people that love Akitas. My special thanks go to Sabina Thiemeyer who helped me research and translate the information into German, to Kathi Eiken who was responsible for making me aware of the healing effects of Johanniskraut oil. For me, the end result is an Akita that smells like dog, the best smell in the world. And the happiness Bushi brings me every time I look at him. Most of these items can be ordered from a German drugstore in Chicago. Merz Apothecary at http://www.smallflower.com or by Phone 1-800-252-0275. Calendumed Salbe: Calendula Gel 7% and 10% is available in health food stores or at Smallflower. Calendula Kügelchen: Calendula Pills, 1-800-252-0275. They are not on the Smallflower Website, but they do carry them. Hettral Johanniskraut oil: Mullein Hypericum Flower oil at Smallflower. Editerm von Virbac: This brand is available in the US. Just ask your local veterinarian to check their veterinary supply house or use a natural shampoo with the minimum amount of chemicals. Humilac von Virbac: Conditioner, the same applies to the conditioner as to the above shampoo.